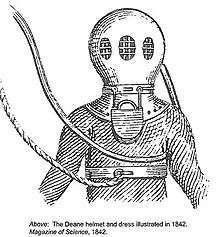 The first successful diving helmets were produced by the brothers Charles and John Deane in the 1820s. Inspired by a fire accident he witnessed in a stable in England, he designed and patented a "Smoke Helmet" to be used by firemen in smoke-filled areas in 1823. The apparatus comprised a copper helmet with an attached flexible collar and garment. A long leather hose attached to the rear of the helmet was to be used to supply air - the original concept being that it would be pumped using a double bellows. A short pipe allowed breathed air to escape. The garment was made of leather or airtight cloth, secured by straps. The brothers lacked money to build the equipment themselves, so they sold the patent to their employer, Edward Barnard. In 1827, the first smoke helmets were built, by German-born British engineer Augustus Siebe. In 1828 the brothers decided to find another application for their device and converted it into a diving helmet. They marketed the helmet with a loosely attached "diving suit" so that a diver could perform salvage work, but only in a fully vertical position (otherwise water entered the suit). By 1836 the Deane brothers had produced the world's first diving manual, Method of Using Deane's Patent Diving Apparatus, which explained in detail the workings of the apparatus and pump, and safety precautions. The US Navy Mk V helmet is still in production to order in 2013. The standard Mk V weighs approximately 55 lb (25 kg) complete. Kirby Morgan dominates the new helmet market, but there have been other notable manufacturers including Savoie, Miller, Gorski and Swindell. 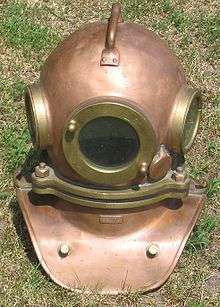 Many of these are still in use; a new helmet represents an investment of several thousand dollars, and most divers purchase their own or rent one from their employer. 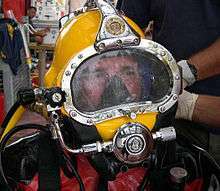 Light-weight transparent dome type helmets have also been used. For example, the Sea Trek surface supplied system, developed in 1998 by Sub Sea Systems, is used for recreational diving. Also the Lama, developed by Yves Le Masson in the 1970s, has been used in television to let viewers see the face and hear the voice of the presenter speaking underwater. 1 2 Acott, C. (1999). "JS Haldane, JBS Haldane, L Hill, and A Siebe: A brief resume of their lives.". South Pacific Underwater Medicine Society Journal. 29 (3). ISSN 0813-1988. OCLC 16986801. Retrieved 2008-07-13. ↑ Cardoza, Rod. "The U.S. Navy Mark V - Diving deep into authentication". Retrieved 2013-12-18. ↑ Staff. "DESCO 29103 Mark V Helium Diving Helmet". Retrieved 2013-12-18. ↑ "Kirby Morgan DSI dive helmets" (PDF). kirbymorgan.com. Retrieved 2016-09-07. 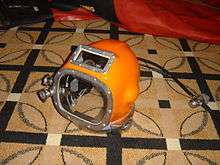 ↑ "Lama dive helmet". divingheritage.com. Retrieved 2016-09-07.